Daniel, a machinist, completed SNAP E&T training through GMT Corporation and has been on the job for eight months. GMT Corporation does production machining for companies like John Deere and Caterpillar and is located in Waverly, IA. These services are provided in communities across the nation to help SNAP participants prepare for, get, and keep good jobs. Through E&T, SNAP participants gain the skills, training or work experience that can help them build a rewarding career path, increase self-sufficiency, and reduce their need for food assistance. But don’t take my word for it-- listen to the people who have received these services and listen to providers themselves in the videos linked below. The videos are from the SNAP to Skills Project which provides states the tools and resources they need to build more effective and employer-driven SNAP E&T programs. These videos, depicting programs in rural and urban communities, highlight the flexibility states have in tailoring the program to their local economies and unique needs. They also document individual SNAP recipients’ powerful success stories as they pursue—and find--their path to employment and a better life. I am inspired by their stories and the commitment of the service providers who help the SNAP participants build successful futures for themselves, their families and their communities. I think you will be too. This video shows how SNAP E&T can help participants move into careers to get on a path to self-sufficiency. The video features individual stories from Christy, who dropped out of high school due to pregnancy, and Mark, who was formerly incarcerated. All of them have gotten jobs after going through a SNAP E&T program. The program not only taught them job skills but showed them how to eliminate debt and build assets. This video shows how SNAP E&T can have an economic impact not just for the participants it serves but for local communities and states as well. 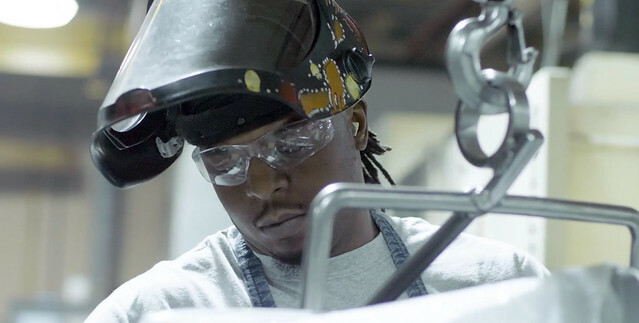 The video provides examples of how SNAP E&T providers like community colleges work with regional employers to identify skills gaps and design SNAP E&T programs that create a pipeline of qualified workers. This video shows how the flexibility of SNAP E&T can be used to tailor programs to the unique target populations and communities that states serve. In Baltimore, MD, the Jane Addams Resource Corporation (JARC) targets people who are facing challenges to employment, including those who lack transportation, or have criminal backgrounds, which, as Elaine Carroll from JARC says, “shuts doors left and right when you are talking about employment, career, and housing.” JARC not only works with SNAP E&T participants on skills training but also has partners in the community that can help with other challenges like housing, childcare, and transportation. This video shows how SNAP E&T can be used to bring together all the resources in a community in partnership to ensure high job placement, job retention, and low recidivism rates among participants. The video features Derek from Seattle, and Robert from Eastern Kentucky, both of whom were formerly incarcerated. Derek graduated from SNAP E&T and is employed at an exclusive health club kitchen. Robert, who had been incarcerated for fourteen years, signed up for a SNAP E&T program through Southeast Community College. He has since graduated with a 4.0 GPA and started a booming painting business with multiple employees of his own. A job represents the American dream and a step toward self-sufficiency. FNS hopes these videos inspire continued efforts by states and their partners to build high-quality SNAP E&T programs that help SNAP participants earn skills and credentials, and that help them build careers.